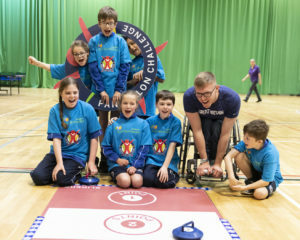 Egerton Rothesay pupil Matthew Bedford exemplifies the hugely beneficial effect that Panathlon has had on students at the school in Berkhamstead, Hertfordshire. Matthew, 11, was part of the winning Egerton Rothesay team at the Buckinghamshire Primary Panathlon at Stoke Mandeville Stadium on March 8. He also competed in our inaugural National Primary Final at the Copper Box Arena in November. By his own admission, Matthew was “not sporty at all” before the school joined the Panathlon programme, but throwing himself into the competitions has helped his co-ordination and balance, and ignited a love of sport. Matthew’s PE teacher, David Walker, added: “We have a number of people who didn’t really like sport beforehand but have grown to love it through the Panathlon events. Matthew wasn’t sporty at all and really struggled with his gross and fine motor movements, but because of Panathlon and the other events done, he is now flourishing. David added: “We have another pupil in our group who really struggles with her focus at school and can be disruptive at times. This is amazing for her. By allowing her to expend her energy in appropriate ways, it will help her academically back in the classroom. Egerton Rothesay have thrown themselves whole-heartedly into Panathlon’s primary and secondary-age events over the last three years and were crowned our National U14 Swimming champions last November at the Aquatics Centre in the Olympic Park in London. “All the pupils massively look forward to Panathlon trips,” explained David. “It’s a huge highlight for them. Our trophy cabinet at school is full of Panathlon trophies and medals, we celebrate their success in assemblies and it’s really helped to boost their self-esteem in PE, particularly in primary. “Before Panathlon came along, we had no events for our primary children to go to in the local area. Through Panathlon we’ve forged connections with other schools and other PE coordinators and arranged football matches and a tennis tournament. We’ve massively benefited. “We are offered many, many trips and could probably go on a sports trip every day of the week if we wanted to. Obviously we aren’t allowed to, but whenever a Panathlon comes along, it goes straight in the diary, whatever else might be on that day.